A lovely dense and formal dome shape is created by this variety without the need of any trimming. 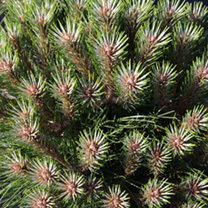 The long needles which measure approximately 7-8 cm in length are a rich green colour. Height 90-100cm. Supplied in a 5-7.5 litre pot.